Walk the aisles of a boat show and you'll see a lot of shiny hulls and decks. Repeat the same exercise at a marina filled with vessels that have been exposed to years of sun and salt, and things don't always look so pretty. Regular cleaning and surface maintenance can make a big difference in a fiberglass boat's appearance, but even more important is the quality of the finish itself. A high quality gelcoat finish is a result not only of the materials used, but the way in which they are applied, as well as the structure that lies beneath. The purpose the gelcoat layer isn't just to create a shine, though that can be an attractive result of the process. The gelcoat is more than cosmetic, it is a protective coating that provides the first line of defense against the elements. Modern gelcoats are made from materials that create a water-repellent layer that keeps moisture from penetrating into the lamination, and provide a degree of UV protection. A smooth, properly-applied gelcoat also creates a surface that is stain-resistant and easy to clean. Beyond selecting the right mix of materials, the greatest factor affecting gel coat quality is the condition of the mold itself. 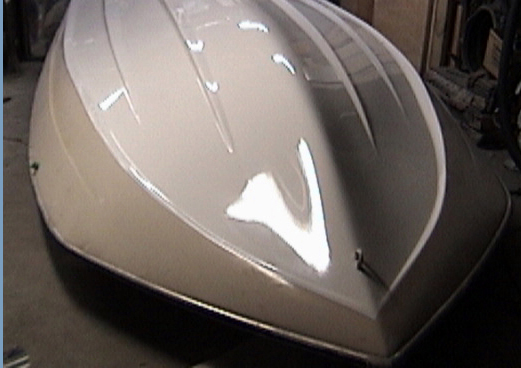 The first step in creating a molded fiberglass part is applying gelcoat to the mold. If there are any imperfections or rough spots on the surface of the mold, they will be transferred to the gel coat. The Mirage factory team hand-polishes molds before each use. This is a more painstaking and time-intensive process than simply running a mechanical buffer over the mold, but it results in a smoother surface that is free of the tiny pits and voids that are not always obvious to the human eye. When gel coat is applied to a properly polished mold surface, the result is a final finish free of even the smallest imperfections. The next step in creating a superior gelcoat surface is cure time. For the sake of efficiency, production builders often pull completed parts from their molds soon after finishing the lamination. At Mirage, we allow each part to cure in the mold for significantly longer periods of time. This allows the gel coat to fully harden, making it less susceptible to the stresses that can lead to small deformities during removal from the mold and subsequent handling. The final factor behind the superior longevity of our gel coated surfaces is the underlying structure itself. Though it is called a gel, the gel coat is actually made up of a hard resin, which is fairly brittle and not particularly forgiving. If the fiberglass laminate behind the gelcoat flexes, shrinks, expands, or is subjected to hard impacts, it can cause surface cracks. Thanks to a combination of materials and methods, our fiberglass parts experience minimal contraction or expansion as they age. Flex is minimized or eliminated through the use of proprietary composite construction techniques, which also serve to dissipate the slamming loads fast-moving boats experience at sea.